Over the course of the project we have been honoured to have been able to host visits from some very special guests. 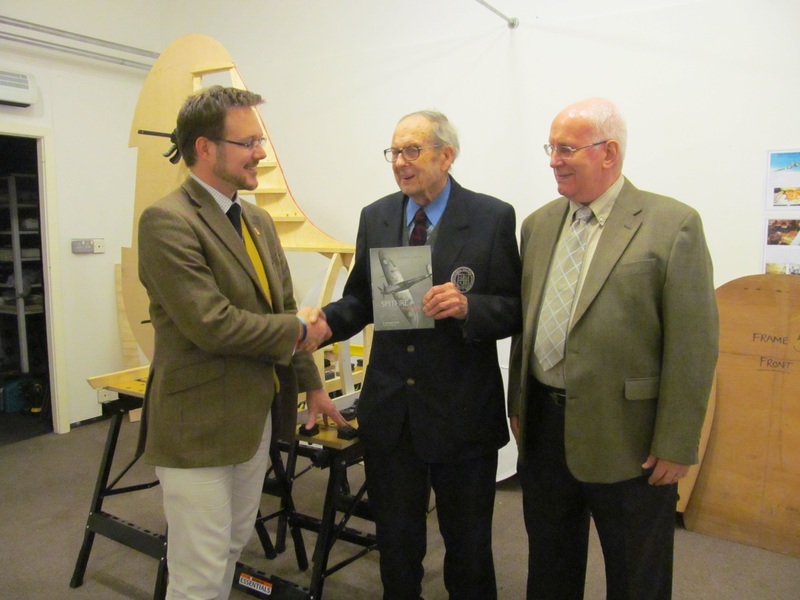 George Mobbs, (centre) presenting Dominic Berry (left) with the Spitfire book in front of The Ratcliffe Spitfire project. 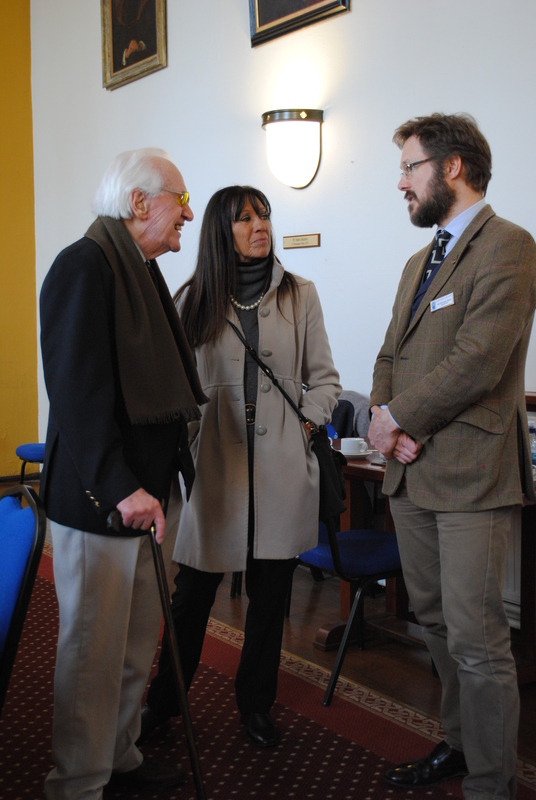 On Monday 18th November 2013 Ratcliffe College welcomed a very special guest; George Mobbs, aged 94 visited with his friend Bill Vernon. They both came to the College to meet Dominic Berry (Head of Art and Design) who is running an extra-curricular club with students, building a replica, full-scale Spitfire. The project, known as The Ratcliffe Spitfire, is being undertaken to honour an ex-pupil, Paul Baillon, who was killed at the end of the Battle of Britain in 1940, and it is in the colours of one of Paul’s aircraft that the project will paint their Spitfire. George and Paul were close friends growing up together and he knew all four of the Baillon boys well. It was just by chance last September, when George happened to catch the one o’clock news on televison that he heard of a dig on Sailsbury Plain to recover a Mk1 Spitfire that had crashed in 1940; and the pilot’s name was Paul Baillon! Since then, George has made contact with Paul’s daughter, Rosemary, and with Dominic at Ratcliffe College. George enjoyed reminiscing about his time growing up with the Baillons, and of his own very interesting time in the army during the war were he became an expert at aircraft recognition whilst part of the home defence. He also presented the project with a wonderful book about the Spitfire which includes a lovely inscription on the inside. 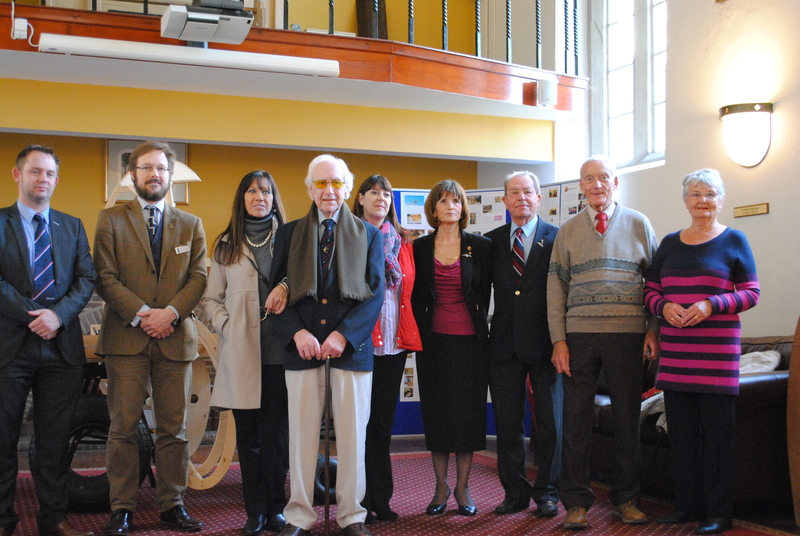 On Wednesday 11th March 2015, we welcomed a number of guests from the Royal Air Forces Association, including WWII Spitfire pilot, Jeff ‘Dicky’ Bird on a visit to see our replica Spitfire project. Dicky had heard about the project some time ago, and had been keen to visit, but it wasn’t until 11th March that mutual times could be arranged. Dicky signed up for the RAF in 1939 following the outbreak of the war, and was sent to South Africa for his advanced training. Whilst on the five week journey south aboard the troopship, he passed the time being taught how to play Bridge by a professional Australian player. As a pair they cleaned the ship of their competition, disembarking in the southern hemisphere with their pockets bulging with £10 notes! In many ways Dicky was fortunate to do his training in South Africa, where he accrued some 300 hours on Spitfires before being sent to fight. Following his training, the troopship prior to his was torpedoed on its journey north, with the loss of many trained pilots, so Jeff elected to head to the front across land, a whole story in itself. Dicky and the other visitors were very impressed with the Spitfire as she stands currently, and was also very interested in the original parts from Mk1a P9503 that we had been given last December. He has already expressed an interest in returning for one of our Sunday workshops so that he can meet the boys, and watch them at work on it.